With practise, you can hold a kanger and sleep through the night – though burned socks and damaged floors could follow. It has been likened to an atom bomb and has resulted in countless burnt socks, pockmarked floorings, and damaged bedding. Proverbs and folklore have been spun around it. It is the reason Kashmir can survive the biting winter. 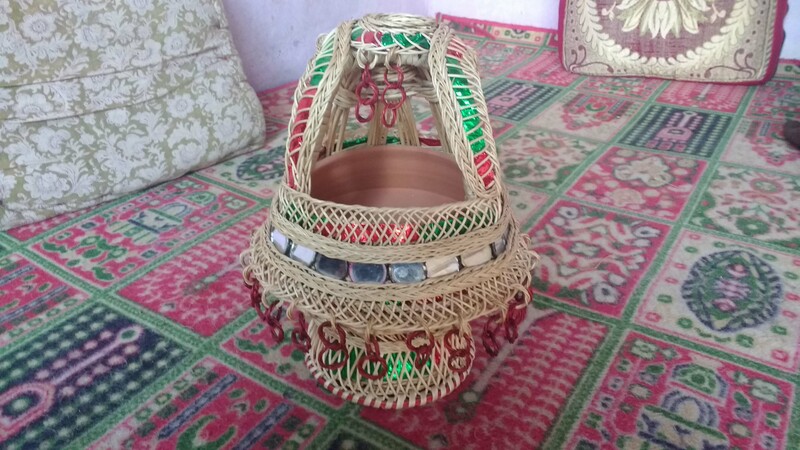 The traditional kanger fire-pot is Kashmir’s preferred way to keep warm – modern gadgets are thought to be more expensive and unreliable. The kanger is a portable heater: it’s filled with burning charcoal and tucked inside woolen pherans, the voluminous and long cloaks so distinctive of the Valley. People accustomed to using kangers can hold on to them through the night without spilling the coal – others spill their kangers even during the day. In the cold months, guests are presented with kangers even before they are served tea. It’s used to roast potatoes and nuts, or warm oranges. But it’s more than just a handy heater. The kanger has seeped so deep into the Valley’s culture, Kashmiris find in it an expression of kindness, love, and anger. 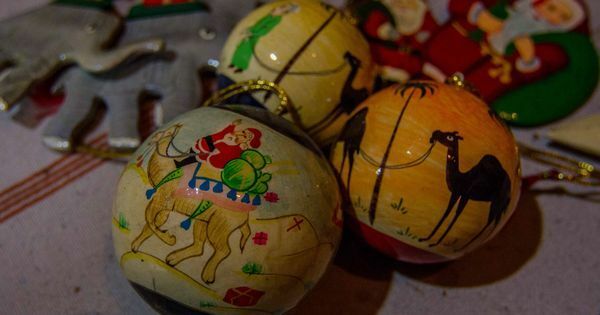 It’s become part of folklore, celebrated in proverb and and poetry. The use of the kanger, according to popular perception, makes one lazy during winters. Perhaps that is what led to the Kashmiri adage: “Rath mein kanger ti vuch mei dav.” Hold my kanger and watch me run. It’s also used at weddings. Decorated with mirrors, rings and jaali (mesh) patterns, the bridal kanger is called “sheesh-daar”, literally “with mirrors”, and is used to burn aromatic seeds called isband during the ceremony. Made across the Valley, kangers from some clusters are known for their distinctive qualities. While the basic model remains the same, the workmanship differs. 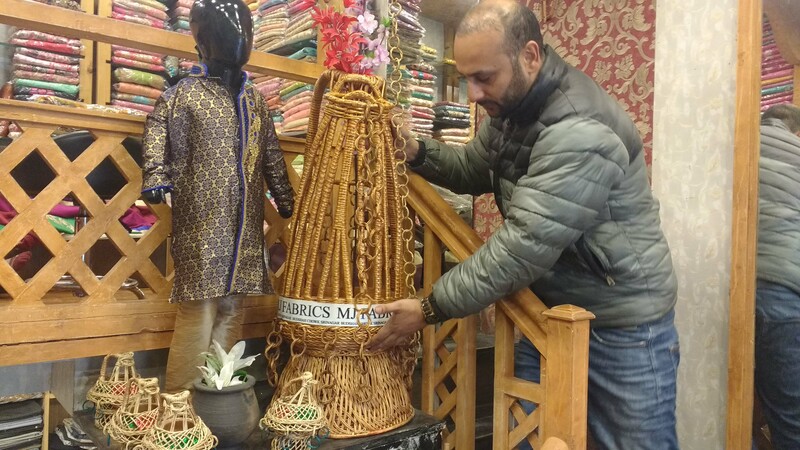 The kangers of the Charar-e-Sharif town are known for their intricate weave and warmth, while the kangers of Bandipora are known for their remarkable strength. Even though the kanger has been used in the Valley for generations, not many know of its origisn. One of the earliest references to the usage of fire-pots, is in the 12th century historical treatise, the Rajtarangini, in which it is called a kasthangarika. Zareef said that artisans began weaving wicker around fire-pots after Central Asian culture began to influence the indigenous Kashmiri culture. Legend suggests that the kanger was made popular among the Valley’s inhabitants by Sheikh Noor-ud-Din Wali, the revered saint of the Rishi order also known as Nund Rishi. His shrine is located in the Charar-e-Sharif overlooking the town known for its kangers. 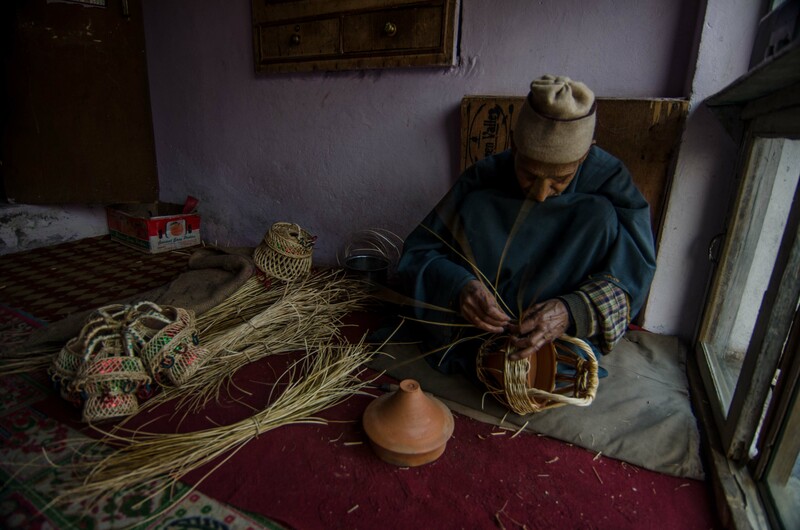 Haji Abdul Gani, a shakhsaaz or wicker weaver in his late 80s, said that it was Nund Rishi’s “blessings that make Charar’s kanger one of the finest”. Gani has spent much of his life making kanger and even today, he considers making kangers a spiritual act that gives him peace of mind. The kanger is a popular decorative item and popular among handicraft enthusiasts. Junaid Handoo, the businessman from Srinagar’s Lal Chowk area, has commissioned the largest kanger in Kashmir – spanning a little less than a metre in height. It took over six months to make. Handoo said his plans to commission another failed due to the political unrest in the state. 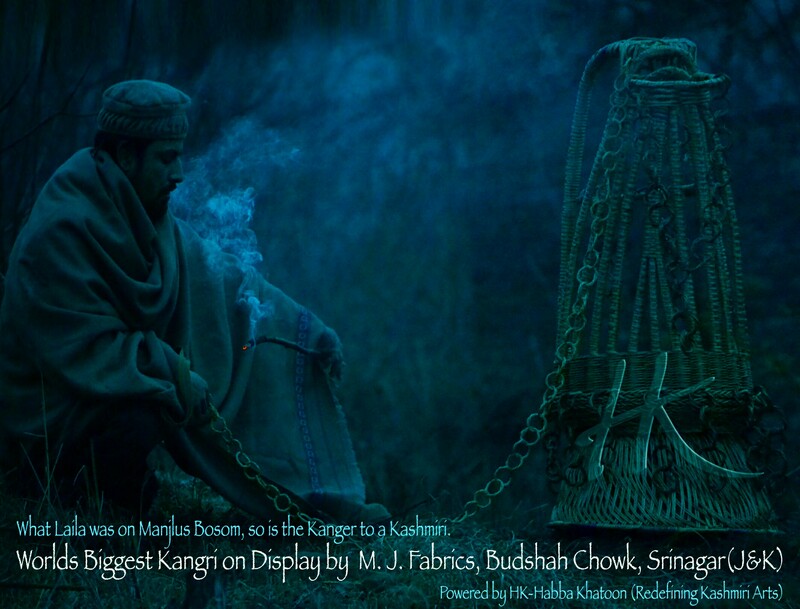 The wicker encasement protects the bearer of the kanger from burns, as the earthen pot inside heats up to high degrees. Depending upon the size of the kanger, up to a pound of charcoal combusts slowly inside it. The layer of ash that forms right on top gradually reduces the heat. To combat this a wooden or metal spatula is hooked to the kanger so that the ash may be swept aside, and the intensity of the heat increased. Shabir Bhat, a shakhsaaz from Charar-e-Sharif, said that the kanger is indispensable because even though modern alternatives are available, electricity in Kashmir is unreliable. Sometimes, the kanger can be turned into a weapon. Poet Zareef Ahmad Zareef recounted an incident from December, 1963, when the Valley was gripped in unrest because a relic belonging to Islam’s prophet had gone missing. Abdul Gani, the shakhsaaz from Charar-e-Sharif, agreed that the kanger has the potential to be rather dangerous. It is, he said with a laugh, an “atom bomb in your hands, inside the pheran”.